In April 2012, visitors to Longleat Safari Park in Wiltshire, United Kingdom, were treated to an astounding sight: an enraged camel pursuing a 4,000-pound white rhinoceros until both animals vanished over the crest of a hill. Startled witnesses to this high-speed chase guessed that the rhino had wandered into the camel’s personal space, maybe hoping to make a new friend. But camels are notoriously bad-tempered, meaning the poor rhino may have been innocent of any wrongdoing. However, as dissimilar as the two animals are, they have on physical feature in common: their humps. When you think of animals with humps, the camel probably comes to mind first. Since the camel's other claim to fame is that it can go for a very long time without water, many people assume that it stores water inside those humps, but that's a misconception. The two main kinds of domesticated camels are the Bactrian, which has two humps, and the dromedary or Arabian camel, which only has one. A camel's humps, which consist of fibrous tissue and fat, weigh up to 80 pounds each and when food is in short supply, the camel's body metabolizes the fat in the humps for nourishment. As Bactrian camels age, their humps often become flaccid and floppy. 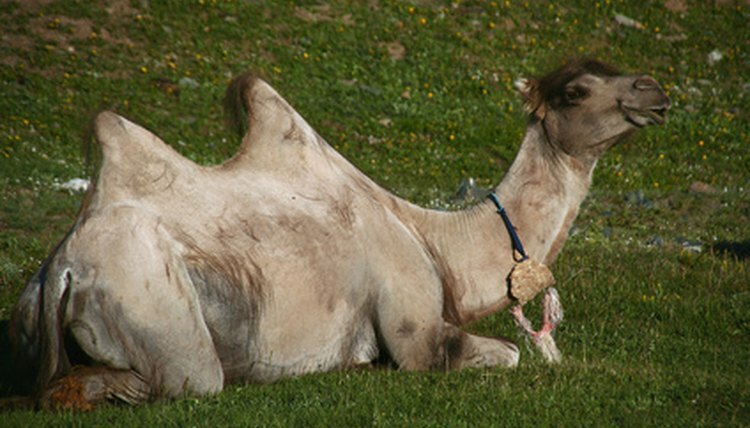 The dromedary's hump shrinks as it gets older but doesn't flop to one side. You have to see a moose in the flesh to really appreciate how immense these animals are. A mature bull, measuring up to 7 feet at the shoulder, could look down on many NBA players. Only the males of North America's tallest land mammal grow antlers, which average 5 1/2 feet across and add another 40 pounds of weight to a huge head with a long neck, but the females have humps, too. According to Kristine Rines, moose biologist for the state of New Hampshire, a moose's hump consists of long spinal vertebrae covered by muscle. No fat is stored there, and the shape of the hump doesn't change in response to shortages of food and water. What's the main difference between black and white rhinos? The seemingly obvious answer to that question -- color -- is also the wrong one. Both of these African rhinos are the same color, brownish gray, and have two horns, but naming the larger breed "white" is believed to be an English misunderstanding of the Dutch word for "wide" -- and the white rhino certainly is that. This animal, which can weigh up to 5,000 pounds, has a longer, heavier head than its cousin and a noticeable hump on the back of its neck, absent in the black rhino. This hump consists of three layers: thickened skin, a pad of fat, and a thick muscle and ligament that support the animal's massive head. Researchers have noticed that when there's not enough food for the rhino, the hump shrinks the same way it does in camels, so they believe it is also an indicator of the animal's nutritional health. Despite the bison's importance to Americans as a symbol of strength, individuality and freedom in the 19th century, this continent's heaviest land mammal, also known as the buffalo, was slaughtered to the brink of extinction. Today, enough grassland to support the tens of millions of bison that used to roam free no longer exists, but conservation efforts have replenished numbers enough that the animal is no longer endangered. Yellowstone National Park estimates that about 30,000 bison live in herds throughout North America, with another 400,000 being farmed as livestock. Like the moose, the bison's shoulder hump is comprised of elongated spinal vertebrae and muscle to support the animal's enormous head. Among people who enjoy eating buffalo meat, the hump is considered a delicacy.